Spotless & Seamless Exteriors is a proud contractor of United States Seamless®, a steel siding brand known for its unmatched quality, timeless beauty, and dependable warranties. 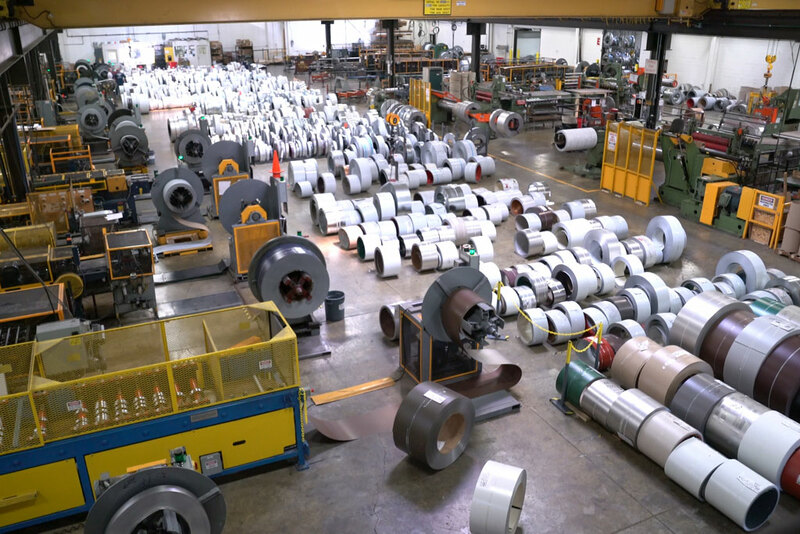 We took a trip out to Klauer Manufacturing, a building product manufacturer in Dubuque, Iowa, to give you a glimpse of how our premium metal siding is made. View our highlight video and read on to learn more about seamless steel siding. Corrosion-Inhibitive Primer – applied to the solid steel core for corrosion protection. Water Resistant Backer – applied to the back for added corrosion protection. Ceramic pigmentation provides long-term, high UV radiation color and gloss retention, formulated with cool roof technology that meets ENERGY STAR solar reflectance requirements. Ceramic hybrid coatings are made of a unique proprietary resin system that withstands acid rain and corrosive environments. This manufacturing process ensures a consistent color application, color retention, and long-lasting finish. Easy to clean and nearly maintenance-free, U.S. Seamless steel is known for its resistance to harsh weather, fading, and chalking. United States Seamless® products are also beneficial to the environment. Steel is one of the most recyclable building materials in the world. With ENERGY STAR compliant finishes, United States Seamless® siding will reflect solar and thermal radiation to keep your home cool in the summer. Steel siding wraps around your home with no seams for airtight insulation and protection during the winter months. As a United States Seamless® certified installer and professional siding contractor, Spotless & Seamless Exteriors can help you decide the best fit for your home. Using heated trailers with roll-forming equipment and cutting tools, we custom-fit siding right outside your home or business. This ensures a flawless finish that will beautify your home and stand the test of time. We are a Minneapolis siding contractor offering many seamless siding styles, including Platinum, Mountain Cedar, and the Northwoods Collection. At Spotless & Seamless Exteriors, we are committed to quality products and detailed workmanship. We earned the Angie’s List Super Service Award (SSA) just this last year, honoring our exceptional service ratings and reviews. As your Twin Cities siding contractor, we take pride in every step of our process, from integrity-driven consultations to careful cleanup. We’ll leave your property looking better than it was when we started.